For many companies, some periods are especially well suited to celebrations, parties and festive moments.This is particularly the case of summer and the end of the year.What better time than to share with your teams, in the breathtaking setting between Annecy and Geneva, a moment of conviviality with the managers and employees of your company and get to relax after a stressful year. And as everyone has the right to let off steam, it is not uncommon for us to have the pleasure of also welcoming members of clubs and associations from Annecy and Geneva. The purpose of these corporate events, before the summer or Christmas vacation, is to thank colleagues and partners, to offer New Year greetings to their teams, and to bring clients and prospects together to enjoy a relaxed and friendly moment around a barbecue for example. These end-of-year parties are not held to talk business but simply to thank everyone for the efforts they have made over the year. The Chartreuse de Pomier in Haute-Savoie stands out from traditional venues, and naturally creates a cozy, festive atmosphere greatly appreciated by all its guests! Company parties: whether in summer or at the end of the year, concoct your own program! Theme evenings, gala evenings, meals or simple buffets, barbecues, food trucks, game or cooking stands… the Domaine de la Chartreuse in Haute-Savoie and its team will create for you a bespoke program for an unforgettable summer or New Year party a stone’s throw from Annecy and Geneva. In addition to our large rooms with their many possible layout configurations, an outdoor marquee can be set up for your company party. Just tell us what you want and we’ll do it! At the Chartreuse de Pomier in Haute-Savoie, we regularly host corporate events (end-of-year dinners and New Year parties, send-off parties, appointment celebratory cocktails, client and partner invitations, summer evening and day events, etc.). Our experience allows us to share with you valuable organizational tips. A stone’s throw from Annecy and Geneva, this exceptional site in Haute-Savoie is the ideal venue for your summer or end-of-year company parties. Our clients are always on the lookout for the right place to federate and unite their teams: it’s vital to remain strong within a group, as sustainable cohesion is normally beneficial for the company. Summer evenings, in the balmy months of May or June, or the end-of-year celebrations such as company Christmas or the New Year allow businesses and other groups to spend an enjoyable, festive time in the company of all their colleagues. These company parties, whether in summer or at the end of the year, are thus highlights in corporate life, and their success is the result of careful preparation, with a sprinkle of originality and creativity thrown in. 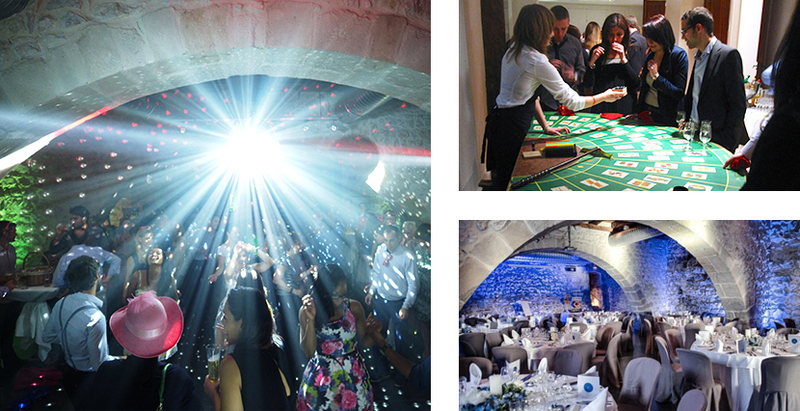 And when you are lucky enough to live in such a beautiful region, a stone’s throw from Annecy and Geneva, why not go the whole hog and add to the ideal ingredients of a company party, a breathtaking and energy-boosting setting and panorama!